Lent is upon us. As is a recession. Not surprisingly, these events can serve each other well. As I pondered and prayed and rationalized my way in and out of various sacrifices for the 40 days leading up to Easter - I landed on my current disaster of the moment for inspiration. I may or may not always make the best financial decisions. I try to be a responsible steward of the money I have, but sometimes pretty dresses, Amazon mp3 sales, and book club memberships can overwhelm my ability to make good choices. I decided there was no better time than Ash Wednesday to make a fresh start. My "fasting" commitment is to try and eat out of my pantry for the next several weeks (sans milk and eggs which truthfully I sometimes leave on the counter, but should be kept fresh.) Although my diet will primarily consist of marinara sauce, Fiber One bars, and vanilla extract - I did realize I had quite a few baking basics. I combined that inventory with my love for all things flour-based and got to cooking. The first recipe on the outside of the White Lily all-purpose bag was Light and Fluffy Biscuits. I halved* the ingredients, since "light" is not a reference to the way they would look on my hips. Plus, I've been known to eat biscuits like grapes, but with melted butter and honey. A couple of things you may have noticed that I'll try to explain. The recipe should have made six, but I didn't have a biscuit cutter. So I used a juice glass with an obvious less-than diameter. This led to 7 biscuits and an inordinate amount of leftover dough. 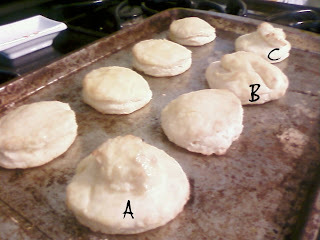 So I snatched a handful and created Biscuit B, which sorta looks like a fluffy dropping from a white labrador. And still I had excess dough, so I split it between biscuits A and C. Waste not, want not. This, ladies and gentlemen, is why I am single...FOR A SEASON. *I had to look up on whether the correct word is "halved" or "halfed" - thank you www.wordreference.com. Biscuits = Simple. Before you say no I need to remind you that you have a nearly Ivy-League degree in Womens' Studies. Surely they taught you gals how to make biscuits. That did not start out as something funny but it turned out that way. Funny how comedy is ain't it? It doesn't matter so much what they look like as long as they taste good - unless you're getting graded on presentation. Like I said, FALLING APART. Hopefully the rest of the week will go well. They did actually taste yummy and yes, I ate them like popcorn. Falling apart is the ultimate understatement of all your understating. Looking at those biscuits reminded me of a dear old friend who I have been neglecting for the past month. I am talking of course about carbs :-) I could live off Biscuits and Gravy. Which would be something those special biscuits would be great for. Good luck on eating out of the pantry.